At Buckley Industrial we supply a wide range of flange and pipe protection products and kits can also be produced for these, depending on the customer’s specific requirements. There are a number of products which are designed to fit many different styles and sizes of Flanges, such as the Push-In Full-Face Flange Protectors and SAE Flange Protectors. This allows maximum flexibility and creates an all-round quality product. 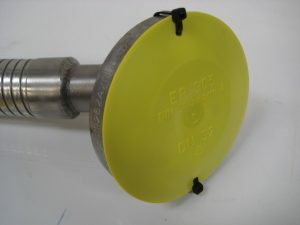 The ranges of flange protectors available from Buckley industrial are moulded in yellow polyethylene plastic to fit 3/8” to 12” nominal sized flanges. Additional features also consist of the quality design, which protects the flange from damage and contamination during the transit, handling and storage process. These are suitable for both imperial and metric flanges to the specifications DIN2627 – 2638, 150, BS 5504 and ANSI B16.5. Push-On Flange Protectors are designed to fit over the ends of Grayloc end fittings. These protectors fit an array of styles and sizes of these fittings and are moulded in yellow polyethylene plastic to fit the same sized pipe flanges as the Push-In Full-Face protectors. For threaded pipe ends, Sealing Plugs and Threaded Caps are designed specifically to fit a selection of sizes and styles. These are also designed to secure Metric, BSP and Swagelok threads from damage during the transit process. They too are moulded in yellow polyethylene plastic, but are sized to fit BSP G ¼ to G2, Metric M10 to M52 and Swagelok 7/16”-20 to 1.7/8”-12. If you require any additional information on the kits available, or have any specific requirements you would like to enquire about, then please contact our dedicated sales team. Additionally, we offer a number of hose testing services and hose products from flexible connectors to couplings, to ensure your equipment if of the highest quality possible and safe to use in your work environment.